Peeling an acidic window mat away from the front of a very fragile watercolor may not sound like a fun way to spend a few hours to most people. To me, once I get beyond the fear of doing damage, it is extremely satisfying meditation. At first, I pry about with different tools, feeling my way to find which scalpel, which knife will work the best with the very particular nature of the paper to be removed. 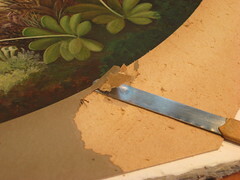 Some move down to the artwork’s surface too quickly for safety. Others are not sharp enough, or are too sharp, or have to be held at the wrong angle. As I work, though, I find the combination and sequence of tools, the right angle, the best direction. I begin to feel as though I understand the way the fibers lay and how to move the tools to lift them with less effort. I enter a bit of a trance, a zone. There is trial and error and a narrowing of attention to the minute level of micron-thick layers of paper that become my world. I have to remind myself not to get too comfortable – there is always a fragment of something stuck in the paper to block the way, a clump of glue that trips the knife and brings it close to piercing the soft paper of the artwork below, but a sense of right movement develops. It is akin to any other kind of sustained focus, like writing well, or the kind of running that is fast and light and free. I want to go forever. I become mind-less in the best zen sense. My hand starts to cramp and my neck strained from keeping it at such an odd tilt, but I want to keep going, unwilling to let the learning go, knowing I’ll have to relearn the paper and the flow of the knife the next time I sit down to work on this project. I stop, clean up, and realize I am much calmer than when I first sat down – the reward of silent focus and one of the best parts of this job. I think this is why many paper conservators are avid gardeners – weeding, pruning, digging etc. all draw one into the moment. Both are solitary, there is a lovely rhythm when things are working, the brain quiets, and the body cramps ; ). Thanks, Rebecca, and I agree about the gardening – although mine is a disaster for lack of time, I feel the same focus you describe. I am glad to know I am not the only one who gets into a zone like that! Beautiful description. I get the same feeling from some object treatments… especially air abrasion of corroded archaeological Ironwork. As an added bonus with this treatment you’re revealing what’s often referred to as the ‘black layer’… black being symbolic of nothingness seemed appropriately zen-like. haha.